This Monday, as we observe Labor Day in the midst of a serious economic recession, we can draw inspiration from the countless number of artists who unified and persevered during the Great Depression. 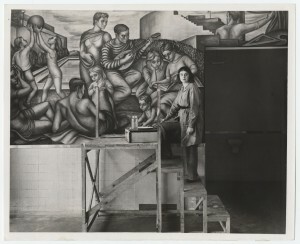 Beginning in 1933, Franklin Delano Roosevelt’s New Deal projects provided work relief for artists, employing them as muralists, sculptors, art educators, and researchers. At this momentous time, artists received commissions from federally-funded art projects and started spirited unions and organizations. The Smithsonian Archives of American Art has in its collections thousands of photographs taken during the New Deal era, as well as an extensive oral history program that preserves the unique voices and passionate stories of these artists. Paired below are photographs and interview highlights, offering a virtual behind-the-scenes glimpse into how artists lived in hard times. 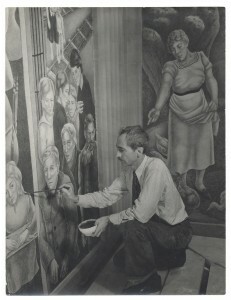 Marion Greenwood (1909–1970), mural painter In Greenwood’s oral history interview, she discusses her decision to leave Mexico to work on an American mural project. This photograph was taken for the WPA’s Federal Art Project Photograph Division. This unit employed photographers who documented the progress of WPA commissions. describes in her interview working as an assistant for other WPA painters while hoping to begin a mural of her own. 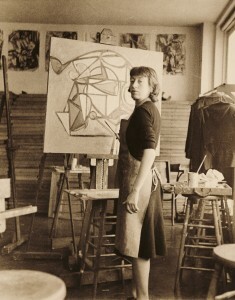 This photograph, taken while Krasner was employed by the WPA, suggests that Krasner had some flexibility to pursue abstract painting on her own, even if her official duties were to assist other artists. Dora Kaminsky, (1909–1977), printmaker Kaminsky expresses her frustrations with the WPA’s bureaucratic process in her interview. 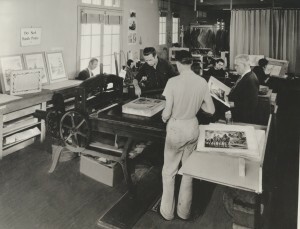 Despite Kaminsky’s protest that the poster division was secondary to the easel division, printmakers, shown at work in this photograph, learned a great deal of technical skills and produced thousands of posters for the U.S. government. Eugenie Gershoy (1901–1983), sculptor Gershoy tells in her oral history interview a lively story of her arrest at a group sit-down strike. Artists young and old unionized to prevent the WPA from unfairly cutting wages. They participated in strikes, marches and rallies. 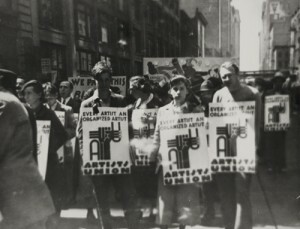 The rally shown in this photograph was organized by the Artists’ Union, an organization founded during the Depression. These photographs and oral histories are part of the Archives exhibition, Hard Times, 1929-1939, on view in Washington, D.C. at the Lawrence A. Fleischman Gallery inside the Reynolds Center for American Art and Portraiture, August 10 to November 8, 2009.